Amanda Michelle (Younkin) Franklin, 25, of Neosho, MO., passed away at the Brooke Army Medical Center in San Antonio, TX, on May 27, 2011, due to complications from burns received in an aviation accident. Amanda was born on March 14, 1986 in Springdale, AR., to Jeanie and the late Bobby Younkin. She was a very accomplished gymnast, musician, animal welfare advocate, and aviation enthusiast. After learning to fly at the age of 16, Amanda became an accomplished multi-engine and tail wheel pilot; she became proficient in over 15 different types of airplanes. As a little girl, Amanda traveled with her father Bobby to airshows across the country. It was there that she was first exposed to airshow wingwalking and met the future love of her life, wingwalker Kyle Franklin. She and Kyle started dating on May 22, 2004. The couple traveled the airshow circuit with their fathers as Kyle continued his wingwalking career. They were married on October 18, 2005 and along with her brother Matt, took over the multi-family airshow business that their fathers left behind. Amanda had managed the brothers’ airshow sponsors and bookings since 2005. 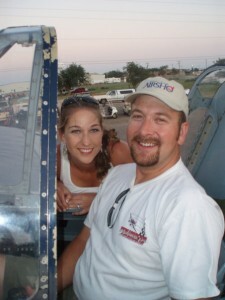 She became Matt’s full-time announcer in 2007 and Kyle’s full-time wingwalker in 2009. Amanda was patriotic and had the utmost respect for those who put themselves in harm’s way in order to protect our freedom. She joined the Commemorative Air Force and also participated for several years in a World War Two style pinup calendar to help preserve the heritage of our country’s fallen heroes. Amanda was also a huge supporter of women in aviation. As one herself, she coached and encouraged young girls that she spoke with at airshows to pursue their dreams of becoming a pilot and to never let anyone hold them back. She was a member of the Arkansas ninety-nines, a group of women pilots that dates back to the nineteen thirties. Amanda made a huge impact in a short amount of time on millions of aviation patrons, airshow fans, and humanity in general. She inspired millions from the young to the young at heart with her amazing wingwalking feats, charming personality, and calendar girl smile. She will be sorely missed by countless people the world over. She is survived by her husband Kyle Franklin of Neosho, MO., mother Jeanie Younkin of Fayetteville, AR, brother and sister-in-law Matt and Michelle Younkin and niece Kimberly of Siloam Springs, AR, grandfather Jim Younkin and his wife Ada of Fayetteville AR, and extended family, all of Fayetteville AR, mother-in-law Audean Stroud and her husband Steve of Ruidoso, NM, and the Franklin extended family. She was also survived by her “four legged children”, Rocky, Rambo, Marvin, and Peggy. In addition to grandparents, Amanda was preceded in death by her father Bobby Younkin, and father-in-law Jimmy Franklin. in Moose Jaw, Saskatchewan- Canada. 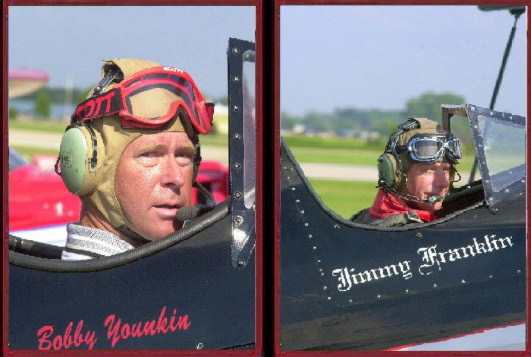 The aircraft he was flying collided with another aircraft piloted by Jimmy Franklin. Jimmy Franklin was not only the best pilot ever in Bobby’s eyes, but he was also one of Bobby’s closest friends. to Jim and Catherine Younkin. He learned to fly at the age of 16. After a brief stint flying U. S. Airmail in the late 1970’s,he ran a successful air charter service. He continued his love of flying by flying air shows, and eventually became Internationally known as one of the greatest pilots in the Air Show Industry. 2 sisters and 3 nieces all of Fayetteville. in Moose Jaw, Saskatchewan – Canada. The aircraft he was flying collided with another aircraft piloted by Bobby Younkin. but also one of the best pilots he had ever known. on May 16, 1948 in Lovington, New Mexico. He learned to fly sitting on his father’s lap, and while home alone at age 12, snuck out and soloed himself. Shortly after, he taught himself aerobatics and began his 38 year air show career at age 19.